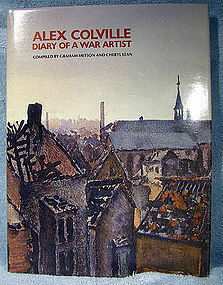 A fine copy of the 12-1/2" x 9-1/2" art book ALEX COLVILLE DIARY OF A WAR ARTIST by GRAHAM METSON and CHERYL LEAN. Published by Nimbus Publishing Limited of Halifax, Nova Scotia in 1981, this 159 page book features matte finish textured watercolour style paper with copious black and white and colour illustrations. The cloth covered book is in mint condition without flaws, and the original dust jacket is is very good condition with some slight edge bumping and a 1/4" tear on the upper spine and two bumped corners. A beautiful book in splendid condition. This item is in excellent condition as described above. All items are thoroughly and conservatively graded and all condition issues are noted; all items are vintage or antique and may have slight signs of gentle use. Surface tracked shipping to the U.S. starts at $21 (other spots may vary, air is higher) - tracking and insurance are included in shipping quotes. Items paid with a credit card will be shipped to confirmed addresses only. We do ship internationally. All of our prices are in $US. PLEASE NOTE: we DO NOT accept PayPal, only VISA and MASTERCARD. A vintage embossed pint milk bottle from the West Flamboro Dairy (in Southern Ontario). 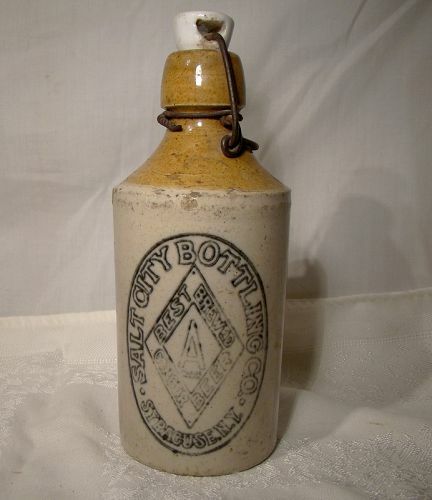 This 8-5/8" bottle has the D in a diamond mark on the bottom for Dominion Glass, and it is in excellent original condition with no chips, cracks, losses, damage or repairs and it has only a very slight patina from use. All items are thoroughly and conservatively graded and all condition issues are noted; all items are vintage or antique and may have slight signs of gentle use. Surface shipping to the U.S. starts at $13.00 (other spots may vary) - insured is higher, and mandatory on items over $95 if paid with a credit card. Items paid with a credit card will be shipped to confirmed addresses only. We do ship internationally. All of our prices are in $US. NOTE: we DO NOT accept PayPal.